Ministry of Defence has both the Army and Civilian Arms to carry out its mandate. The civilian arm ‘supports and facilitates the Uganda Peoples’ Defence Forces (UPDF) and comprises while the Armed forces are responsible for the National defence and Security. The Ministry is the overseer of the Uganda Peoples’ Defence Forces. This is to ensure that a professional Uganda Peoples’ Defence Force which is accountable to the people while focusing on protecting its citizens, defending its sovereignty and contributing to regional stability. Minister of Defence is charged to provide political leadership to this Ministry. A Permanent Secretary is the Chief Executive and Accounting Officer for the whole Ministry with Departments of Finance, Administration and Logistics. 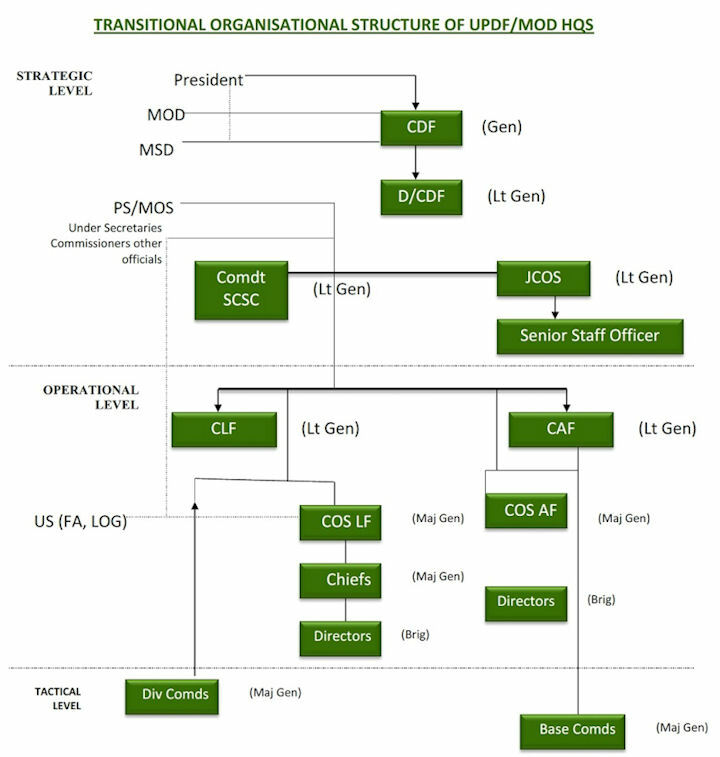 The Ministry has two parallel organizational structures at its headquarters; one in the Ministry headquarters headed by the Permanent Secretary and the other in the Army headquarters headed by the Army Commander. Both Army Commander and Permanent Secretary are below the Minister of Defence. There is prevalence of duplication of functions and roles in both structures, which engender conflict. The Army remains responsible for operational decisions while the Ministry Headquarters retains the powers on financial resource decisions. The Uganda People's Defense Force (UPDF) -- previously the National Resistance Army -- constitutes the armed forces of Uganda. The UPDF's land and air forces have 50,000 soldiers, including approximately 6,000 deployed to AMISOM and the Operation Lightning Thunder (OLT) counter-LRA operations in central Africa. As the first country to deploy troops to AMISOM when it was established in 2007, Uganda played a key and growing role in advancing regional peace and security. In recent years, the UPDF has become a modern and professionalized force that has largely moved beyond the human rights abuses committed during its military intervention in the DR. in the 1990s. However, there are still reports of human rights abuses committed in the UPDF's ongoing Karamoja disarmament campaign in eastern Uganda, and some UPDF entities are alleged to have committed human rights violations with other organs of Uganda’s security apparatus against the political opposition. For the first time in Uganda's history, the national army acquired constitutional standing in the legislative process by virtue of the requirement in the 1986 proclamation that the National Resistance Council (NRC) had to consult the National Resistance Army Council (NRAC) on any matter the NRC thought important. In 1989 amendments to the original proclamation expanded this principle by declaring that both the NRC and the NRAC "shall participate in the discussion, adoption, and promulgation of the Constitution." The book Militarized Democracy: The Uganda Case is written by Dr Busingye Kabumba, Dr Timothy Kyepa and Dan Ngabirano of Development Law Associates, who argue that the UPDF, which morphed from a rebel outfit of the National Resistance Movement into a national army, continued to serve the interests of NRM as opposed to becoming a national army. Although the trio acknowledge that NRM has made inroads in ushering in a new era of democracy in Uganda, its continued grip on the military has eroded those gains.